The gray whale killed in the Kuskokwim River is butchered and the meat and blubber distributed on July 29, 2017. We’ve come to the end of another year in the Yukon-Kuskokwim Delta and through it all, KYUK has covered the region’s joys, tragedies, institutional development, daily living, and so much in between. Before this year comes to a close, KYUK looks back on the stories that defined 2017. Bethel musher Pete Kaiser captured a three-peat, winning his third consecutive Kuskokwim 300 Sled Dog Race. He’d go on to earn ninth place in the Iditarod. Lewis Pavilla of Kwethluk became the first musher to win four Bogus Creek 150 races, and Cameron Jackson of Akiak took first in the 50-mile Akiak Dash. Musher Lewis Pavilla of Kwethluk arrived in Bethel frostbitten and the first four-time Bogus Creek 150 champion on the morning of January 21, 2017. 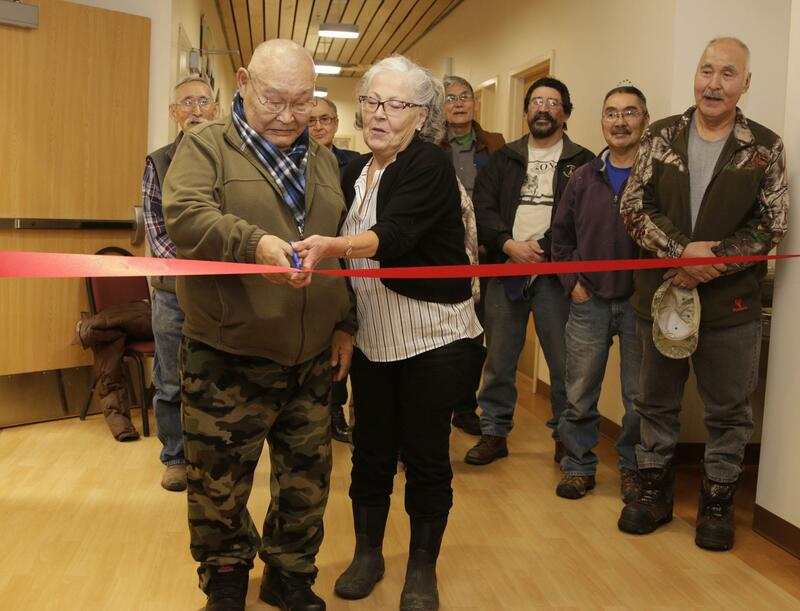 The Yukon-Kuskokwim Health Corporation celebrated the ribbon cutting on its new substance abuse treatment center. It’s the state’s first rural treatment center for opioid addiction that combines addiction medicine and behavioral health counseling. Representative Zach Fansler was sworn into the state Legislature. The move helped shift the House of Representatives to a Democrat-led majority coalition. That majority dwindled later in the year when Democrat Dean Westlake resigned following allegations of sexual misconduct. Governor Bill Walker declared Alaska’s opioid epidemic a state disaster. Over the following months he proceeded to dedicate resources and create policy changes to address the issue, such as dedicating state and federal funds for overdose medication. Freshman Hayden Lieb became Bethel Regional High School’s first All-American Wrestler, securing the title at a national tournament in Virginia. Later in the year, Bethel Regional High School took home the gold for the second year in a row at the Division II State Wrestling Championship. The win marked Bethel’s eighth state victory. After 30 years of conservation efforts, a subsistence emperor goose hunt opened on the Yukon-Kuskokwim Delta. The decision emerged from a historic co-management agreement between tribal, state, and federal managers. The Yukon-Kuskokwim Delta lost Greg Roczicka, one of the region's most respected subsistence fishing and hunting advocates, when he died in his Bethel home at the age of 61. Bethel Police Chief Andre Achee retired after 23 years with the police department. The city hired former State Trooper Burke Waldron as Interim Police Chief, and he’s worked to build more transparency between the department and the public. A large portion of the Kuskokwim River closed to gillnet fishing to conserve the declining king salmon by federal emergency order. Only two gillnet openings were allowed in June, and fishing for the species was restricted to local, federally-recognized subsistence users. Salmon caught during a rare gillnet opening on the Kuskokwim River on June 24, 2017. Yukon king salmon arrived early in the largest run observed in more than a decade. Meanwhile, Kuskokwim king salmon arrived late, but many Kuskokwim tributaries met their escapement goals. 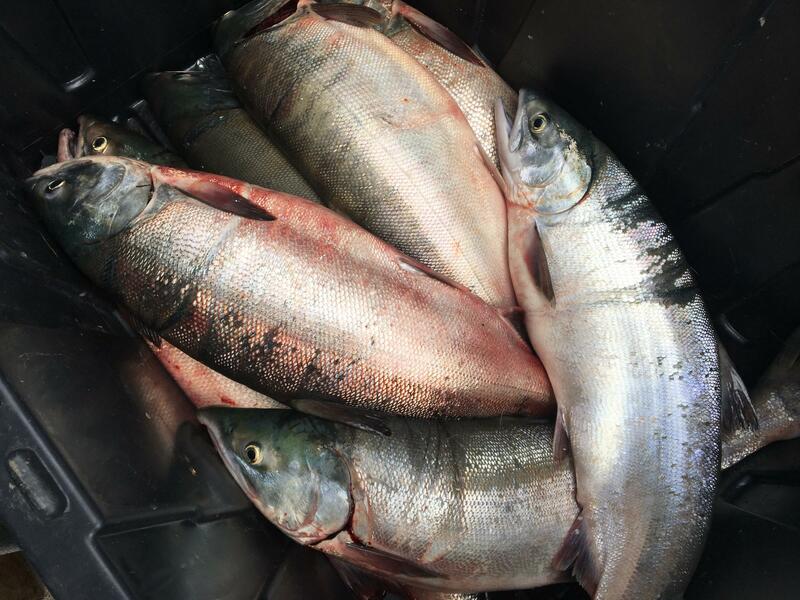 The Kuskokwim also saw some of the highest red and chum salmon runs on record. For the first time in living memory, a gray whale swam up the Kuskokwim, reaching Napaskiak before residents killed the animal with automatic rifles and seal harpoons. The carcass sank, but floated to the surface two days later. 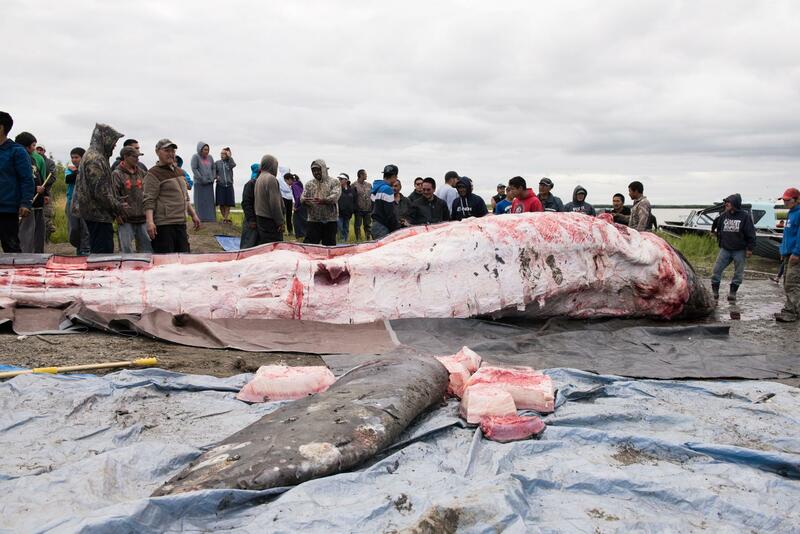 The residents pulled the whale to shore and divided the muktuk and meat. Aniak grieved after a shooting spree left several residents wounded and one resident, Bruce “Gotor” Morgan, dead. Ten Yukon-Kuskokwim Delta tribal representatives signed a treaty to form a provisional "Nunavut Alaska Government" with the goal of uniting the region’s 56 tribes under a single governing body. A fish buyer under the Oregon-based company Fishpeople opened in St. Mary’s in District Two of the Yukon River. The opening meant that commercial fishermen in the area did not have to boat to Emmonak to sell their catch. As the permafrost thaws, Kongiganak's cemetery is turning into swampland. Community members are now laying their loved ones to rest on raised platforms above the ground. The State charged 23 Bethel residents, most of them cab drivers, with bootlegging following a two-year, undercover investigation. 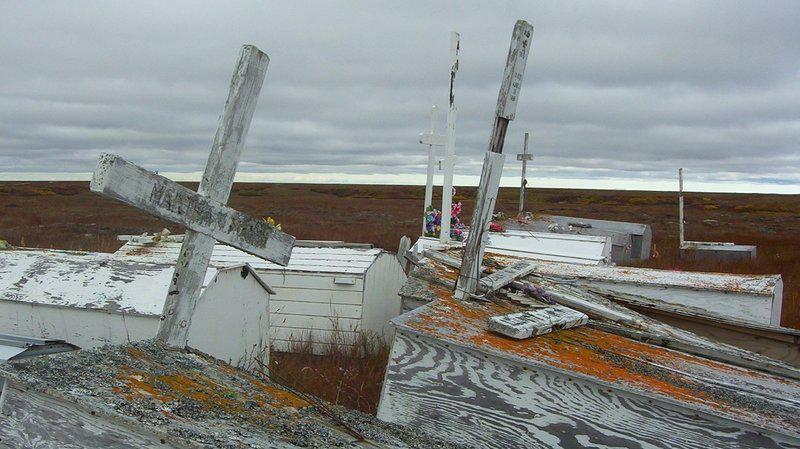 Rapidly melting permafrost turned cemeteries in Kongiganak into swamps and stopped flights to Tununak after buckling the village’s newly built runway. 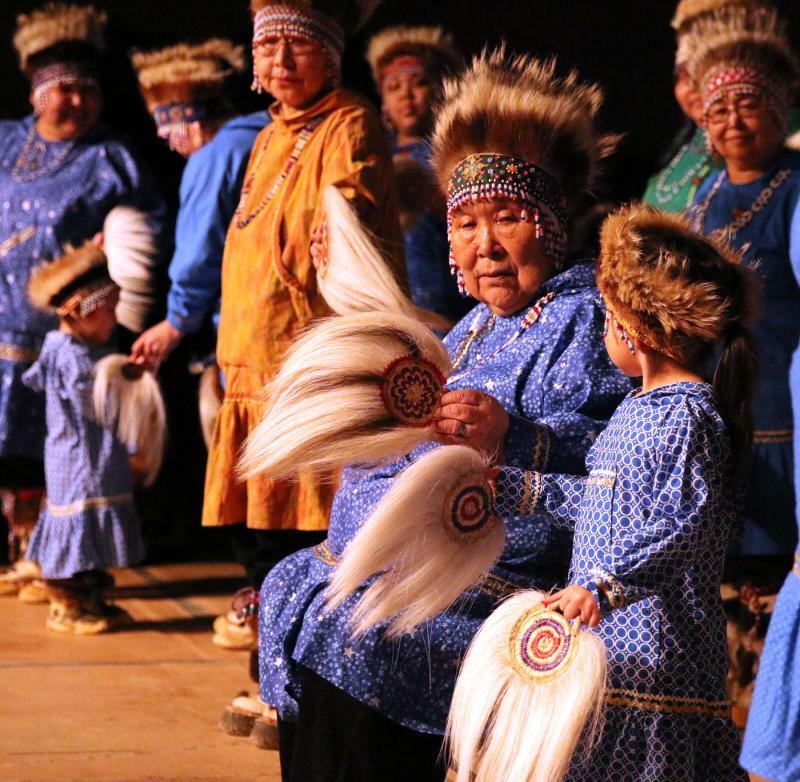 The Association of Village Council Presidents, along with more than a dozen tribal organizations, signed a historic compact with the State of Alaska to yield child custody cases to tribes. Cezary Maczynski’s Kusko Liquor received Bethel’s third and final liquor store license. He still has to modify his property to meet city code in order to make the license official. Robert Nick’s body was found inside the airport fence after days of searching by Bethel Search and Rescue, raising questions about emergency response and police procedures in Bethel. 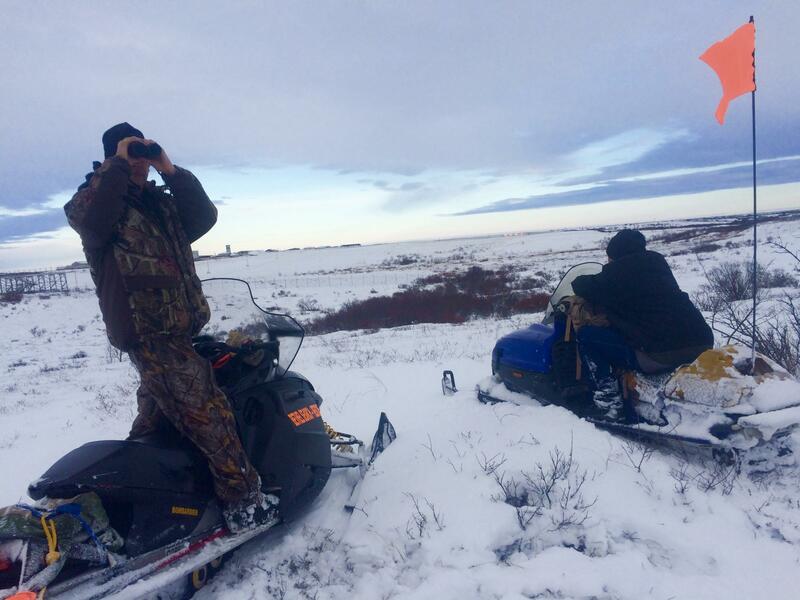 Bethel Search and Rescue members scan the tundra looking for signs of animals scavenging on November 28, 2017, hours before Robert Nick was found. The Bethel runway lies in the background. Bethel Search and Rescue reported a sharp increase in calls for help, saying that the calls arrive nightly and mostly involve alcohol. The all-volunteer organization requested that the Bethel Police Department share more resources and modify procedures to help Search and Rescue respond. Parents, police, and school staff uncovered incidents where Bethel Regional High School students had been selling edible marijuana gummy bears. Bethel Search and Rescue reported more and larger open holes on the Kuskokwim River and sloughs than its members ever recalled seeing. From all of us at KYUK, we wish you a Happy New Year and thank you for sharing your stories with us. As we approach the end of the year, we're looking back on the stories that defined the past 12 months in the Yukon Kuskokwim Delta. Here are the top stories from 2016.